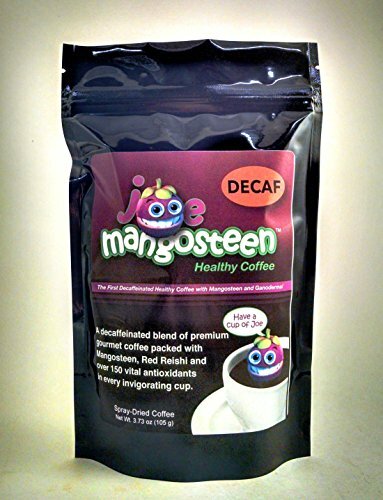 Joe Mangosteen Coffee - Healthy Instant Black coffee with Ganoderma & Mangosteen (3.73 oz bulk bag) Please note: We are now shipping this item! Joe Mangosteen will be going thru the process of having it certified orgainic by USDA, At this time, according to regulations, this product is not considered an approved organic product even though they are using all orgainic ingredients. Try this product! We guarantee you will love it! Joe Mangosteen is the first healthy coffee with Mangosteen that offers a rich supply of Xanthones. It also contains Organic Ganoderma Lucidum which provides 1,3 beta-D-glucans, triterpenes, polysaccharides, ergosterol, polyphenols, adenosine and antioxidants. Made from organic Arabica beans, this fine gourmet coffee has been carefully selected and separately harvested. The processing to spray dried coffee is also achieved without the use of any preservatives or additives. Our coffee beans are shade grown at higher elevations which produces a naturally flavorful, yet mild taste. If you have any questions about this product by Joe Mangosteen, contact us by completing and submitting the form below. If you are looking for a specif part number, please include it with your message.